This photo was taken on January 5, 2019 at 2:25 PM. The location was in the drive in area in front of a very nice large hotel near the convention center in Washington DC. The "Take It!” was an immediate impulse which had to be held in check - then revived as I was able to comprehend what I was looking at. At first glance - it looked like I was viewing a dead mouse - complete with long tail and some shriveling which goes along with the process. 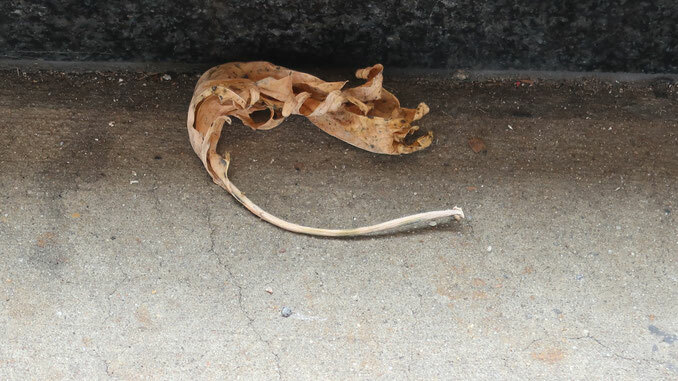 Upon second glance - I was able to see that what I was looking at was a fallen leaf that was going through its own drying and curling process that by beyond chance - had it looking like a mouse in the same state. To those I showed this picture to - and said it was a dead mouse as a part of the introduction - found them all - looking very closely at the image - for they did not believe I would take a picture of such a thing. Each of them seemed to be relieved to have determined that it was a fallen leaf. A part of this photo which I found to be fascinating is the set of color shadings found on the contours of the steps upon which our subject was located. Here is hoping you got as much fun out of this one as I have. Wishing you my very best. For a split second I actually thought it was a dead mouse and squirmed a bit. Our youngest let out a very high pitch "EWWWWWWWWW" until I told her it was actually a leaf. This one brought me great joy, watching the women in my life freak out thinking it was really a dead mouse for a few seconds. Freeze dried mouse! Quite the delicacy. This made me laugh hard! Please, please, please don't ever post a photo of an actual dead mouse on your site. LOL!